This pretty salad of pale yellow corn nestled in dark red radicchio leaves is perfect for a buffet dinner, because the salad can easily be transferred from the serving dish to a dinner plate. I have always thought we had great corn in Texas; however, the corn I find at roadside vegetable stands in the northeast when I visit states like New Jersey and Connecticut blows me away. I always buy some to take back home on the plane. Note: If you can't find fresh chervil you can substitute basil. For the Vinaigrette, pour the olive oil and vinegar into a small bowl and whisk until emulsified. Season to taste with salt and pepper. For the Corn Salad, place the ears of corn, complete with husks in place, on the turntable of a microwave oven. Cook on high for 8 minutes. Remove from the microwave and set aside to cool for a few minutes. Remove the husks and corn silks from the corn and then break off the stem, taking care to hold the ears of corn with a paper towel to avoid burning your fingers. Stand a cob of corn vertically on a cutting board and, using a sharp knife, slice the kernels off the bottom half of the ear of corn. Flip the ear of corn over and slice the kernels off the other half. Cut the kernels off the other ears of corn in the same manner. Transfer the corn kernels to a large bowl and discard the cobs. Add the red bell pepper, onion, capers, and the vinaigrette. Toss well to distribute the dressing. Add the feta and chervil and toss again. Set aside. Remove eight large leaves from the head of radicchio. Arrange the leaves on a serving platter to form cups. If the leaves are not concave enough to form cups, remove additional leaves and combine two leaves to form a cup. 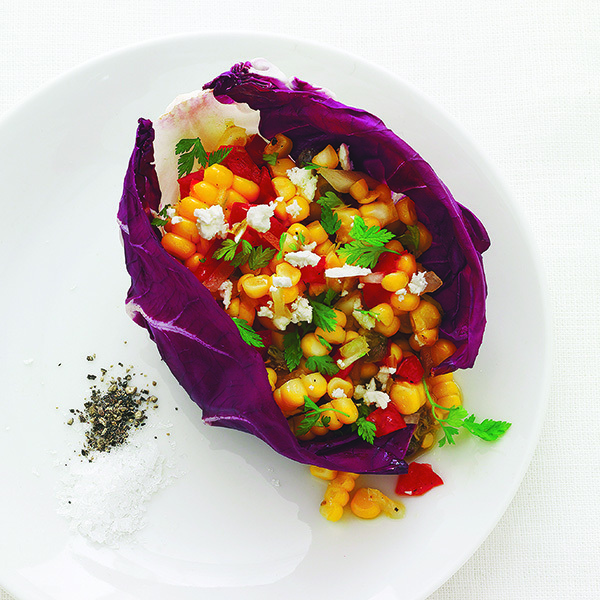 Spoon the corn salad into the radicchio cups.